Today Coburg belongs to Bavaria. In 1918 it belongs to Saxonia on the border to Bavaria. A lot of soldiers did their duty in the bavarian army, so the owner could become this decoration. fantastic medal group. with the Saxe Gotha medal it is superb...and maybe identifiable? is the bar 1914/15? Hi Ulsterman the bar on the Coburg medal is 1914/17. Glad you like it. I don't suppose you know if the Saxe Coburg silver medal rolls have been printed and if so how could I get hold of a copy? 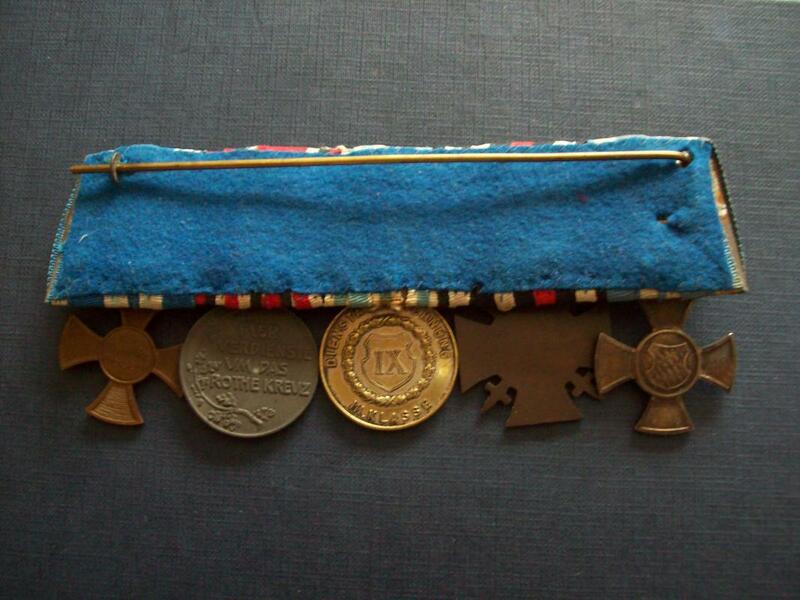 This time a four medal bar of a through the ranks Leutnant. Interesting in that he doesn't seem to have received any other Bavarian award (apart from DA3) before being made Leutnant. Presumably must have served some years either before or between the 1905 and 1911 Jubilee medals and got recalled for war service, achieved his DA3 then got made Leutnant fairly early in the War. Hence his real gold MVO4X, though I understand some real gold ones were recycled later in the war when pot luck may have secured you one! A serving officer has not wear any NCO service awards. 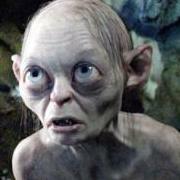 For a long-serving NCO I lack the Jubiläumsmedaillie. The bar looks good and the decorations too. 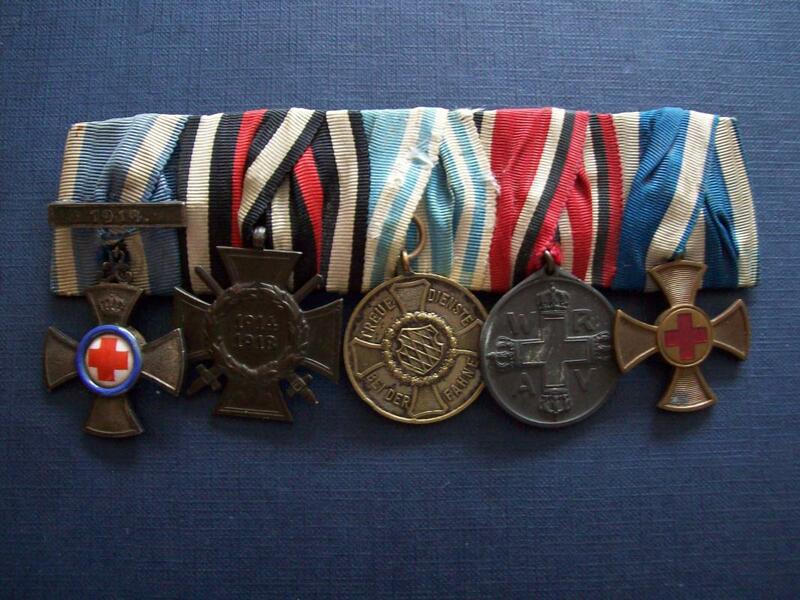 Possibly the MVk was changed into a MVO, or the sevice medal, was a Landwehr-sevice medal. Sure? Would someone promotoed to Leutnant dR put it away? Sicher? Würde jemand, der zum Leutnant dR befördert wurde, sie ablegen? Here is the next question. When he was promoted to LT. d. Res in 1918, why did he get a MVO with golden medaillons? I know officer-bars with Landwehr-Dienstauszeichnung II, bur not with regular NCO-service award. According to regulations, the officer service award startet with 24 years. Interesting discussion guys I got my assumptions from a thread I read on here from a similar question asked by Chris Dale hope its ok to paste it as it makes great reading and is another knowledgeable reply by Rick. EM & NCO received medals for 9,12 and 15 years of service. Officers received crosses for 24 and 40 years of service. If a soldier was promoted to an officer after let's say 13 years of service was he allowed to wear a medal for 12 years? Or did he have to return any LS medal and wait another 11 years to get 24 years cross? Or one could become an officer only after 24 years of service? Good question. Here's Rick Researches answer to a similar question (I hope he won't mind me quoting him from the Wehrmacht Awards Forum http://www.wehrmacht...ead.php?t=26723 ). "The M1913 IX years service medal on the right was given only to enlisted ranks. When found in an officer's or official's group, such an award indicates service up from the ranks. Typically, Feuerwerks, Veterinary etc officers spent long years as NCOs before being commissioned, and in such cases they continued to wear their enlisted long service awards, but these were not made TO officers." Hope this helps, also as I understand it as soldiers received crowns to thier MVO4's or indeed MVO3's they had to return thier old award first before the new one was issued. These returned awards were then recycled so an early war gold centre one could be awarded later in the war if you were lucky!! My next contribution is a five medal medic bar and is one of my favourites hope you like it too. Prussian 3rd class red cross medal in zinc. Bavarian 20 year red cross service medal. The owner obviously loved his bar as he has polished most of the silver finish off of the DA3.Interestingly the FEK is with swords, any thoughts on this? Perhaps he was a front line medic? A seven medal Beamten bar for you, I am hoping to find a name to this one at some stage, must be quite a rare combination. DA1 15 year long service medal. Any help or thoughts on the possibility of finding who this belonged to would be greatly appreciated, but most of all I hope you enjoy looking at it. I don't think its possible to find the name, as the wearer was not an officer... Still a very nice bar though. There is no Reuss regimental connection to any Bavarian regiment, so the Reuss medal likely indicates he was born there. You can try to search in Ancestry.com's Bavarian Army records under birthplace for Reuss or for various cities in the two Reuss principalities like Greiz, Gera, Schleiz, Lobenstein or Zeulenroda. You might get lucky and find a candidate or more, but you would not be able to say with certainty, since there could be other candidates. Also, whoever digitized the records for Ancestry.com did a horrible job in spelling the names of people and places, especially for places outside Bavaria. So even if you searched for every town in Reuss as a birthplace, you wouldn't find them all. But, again, you might get lucky and find some potentials. That grade of the military merit cross on the ribbon for war merit usually went to junior military officials in the rank of Beamten-Stellvertreter: Zahlmeister-Stellvertreter, stellvertretender Lazarett-Inspektor, stellvertretender Feld-Magazin-Inspektor, Waffenmeister-Stellvertreter, etc. are you sure with Hemmerle for the mvk ? The picture is to bad, to identify the maker. The swords look like Deschler. Andreas you are of course correct it is a Deschler piece my mistake, fooled by the poor pictures taken on my old camera. 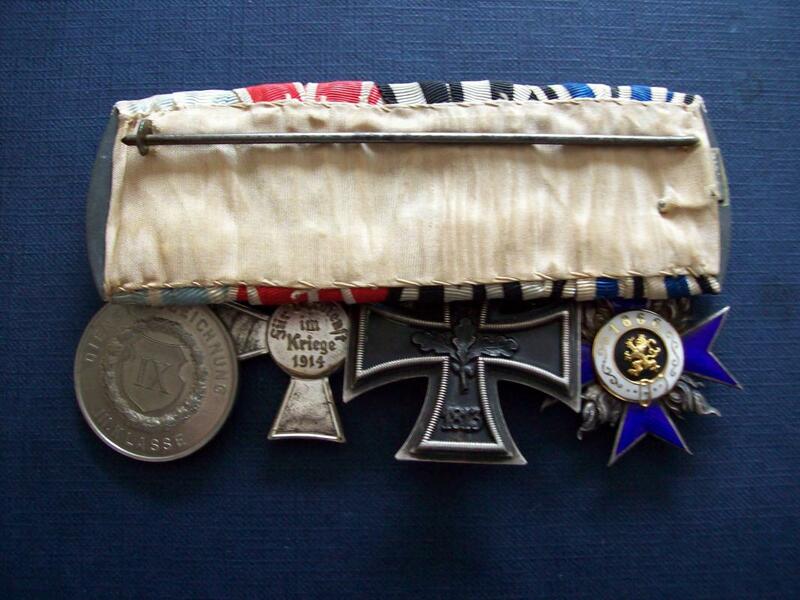 I got the medal bar out and had a closer look, definately Deschler, thanks for pointing that out. Also with the bar in hand I would say that the Reuss medal is definately a gold (gilded) one. In the areas that haven't been exposed to wear it is quite golden in colour. Which if I understand correctly means at least 12 years in the job. Thanks for your help in trying to track the guy down Dave. Does anyone know if the rolls for this Reuss medal have been published or indeed if they have survived? No Reuss military award rolls survive. All award records for Reuss Elder Line were destroyed. For Reuss Junior Line, there are some files with award recommendations, but no award rolls for most military records. There is a roll for non-military awards, which actually has a few military awards mixed in, but it only includes a tiny fraction of these awards. Thanks Dave, what a shame! Here is a nice Bavarian bar from my collection. It is interesting in the face it has a 25 years faithful service cross and a 10 year NSDAP award on the end. Nice 9 placer to someone who branched into the luftwaffe. 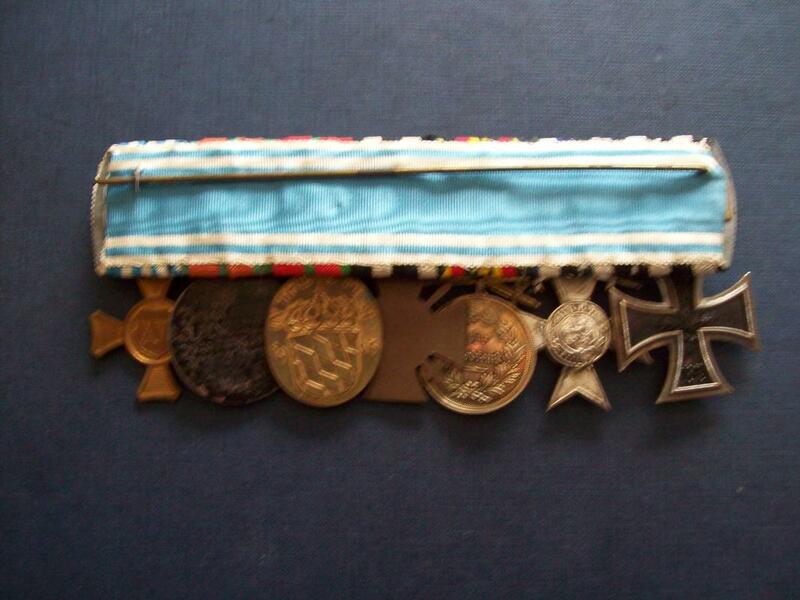 Another 9 place luftwaffe ribbon bar. 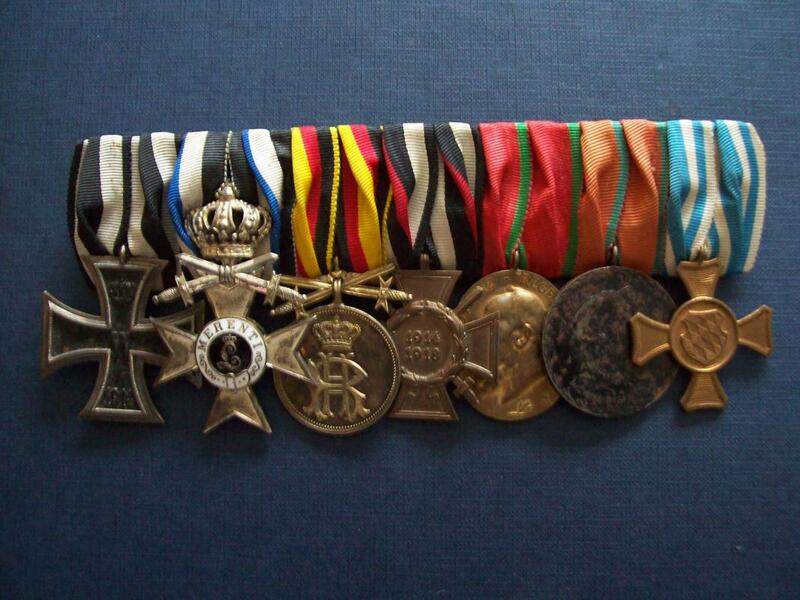 Prestigous German ribbon bar with some Finnish decorations. Ribbon bar with the Bavarian military service decoration 4th class. For someone who eventually endured 40 years long service. This is a nice Godet style ribbon bar, judging by the back catch. that would be my favourite bar. It would be very intersting, to know the name of the owner of this bar. 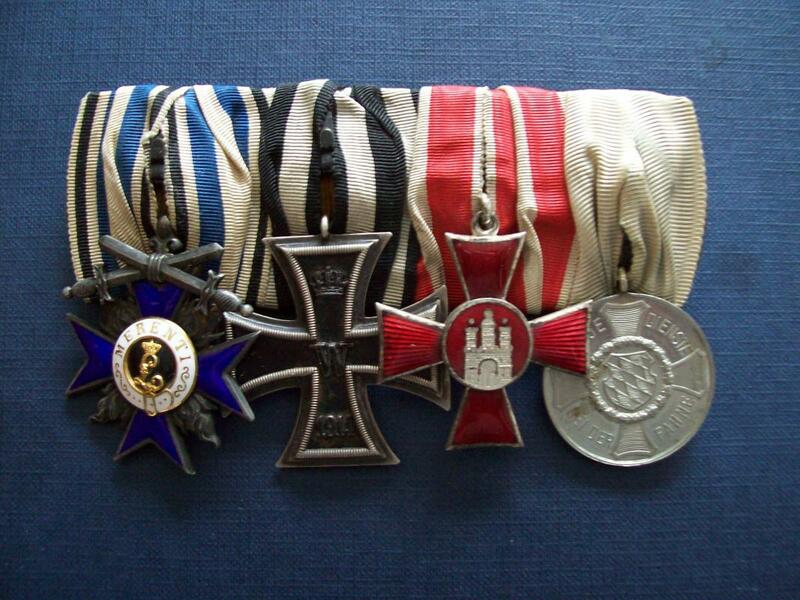 The second ribbon could be for the bavarian bravery-medal or for the Militär-Max-Joseph-Orden.